Just like what I mentioned in my last post, I am launching a new series called "PiTCC's Favorite Dishes from Around The World" today. It's where I will ask a fabulous blogger every 1st and 3rd Wednesday of the month to guest post here on PiTCC with one of my favorite non-Filipino dishes. I am a person who loves to eat and though I love Filipino Cuisine so much, I enjoy lots of other cuisines too. This new series on my blog is my way of sharing with you what those other cuisines are and what specific dishes from those cuisines please my taste buds.I believe that doing this will give both you and me the chance to learn authentic recipes from trusted resource people in the blogging industry, and that's really awesome, right??? As I've told you many times, I'm a big lover of seafood. That is why I've chosen a seafood dish to be featured first on PiTCC's Favorite Dishes from Around The World. It's also Holy Wednesday today and some people abstain from eating beef, pork and poultry, so this is really timely! 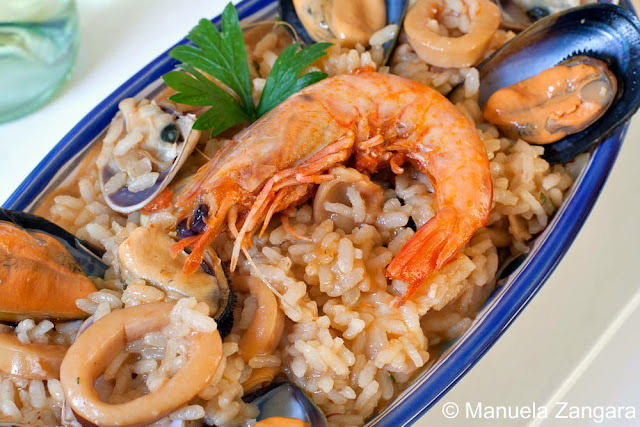 The dish I'm talking about is called Risotto alla Marinara or simply Seafood Risotto. I had this delicious Italian dish several times at Italianni's Restaurant when I was still in the Philippines. I have been wanting to learn the original version of it, and yes, now is the perfect time! I believe no one can give me the most authentic recipe for Risotto alla Marinara other than my good friend Manu of Manu's Menu. Manu and I started food blogging almost the same time last year. Though we haven't met in person yet, I feel that we have a very special bond. We may not keep in touch that often, but I know that she's someone I can really depend on here in the blogosphere. Her willingness to do a guest post for PiTCC is a great proof to that, right??? With her very busy schedule both as a mom and blogger, I am glad that she found the time to be here with us today. It is such an honor for me to have her! Without further ado, let me bring you our first guest blogger here on PiTCC...Manuela Zangara!!! Hi everyone! I am Manuela, the author and creator of Manu’s Menu. I was born and brought up in Milan (Italy) by Sicilian parents and my passion for cooking can be traced back to my childhood, when I used to prepare meals together with my parents. I come from an artistic family and I often say that cooking is my art of choice. After moving to Australia in 2006 and becoming a mother of 2 beautiful daughters, I decided to create a blog to share my passion for cooking and to spread the concept of authentic Italian home cooking to the world. When my dear friend Tina asked me to write a guest post on Risotto alla Marinara for her beautiful site, I couldn’t have been more thrilled. I have a soft spot for risotto, and it is the first dish I learned how to cook completely on my own as a child. Making risotto is very easy, you just need to know a few simple rules and the great part is that the method is always the same: after you master the basic technique, you can make ANY kind of risotto you like. Making Risotto alla Marinara is no exception and even though it does require a bit of time and a few extra steps, it is no more complicated than any other risotto. 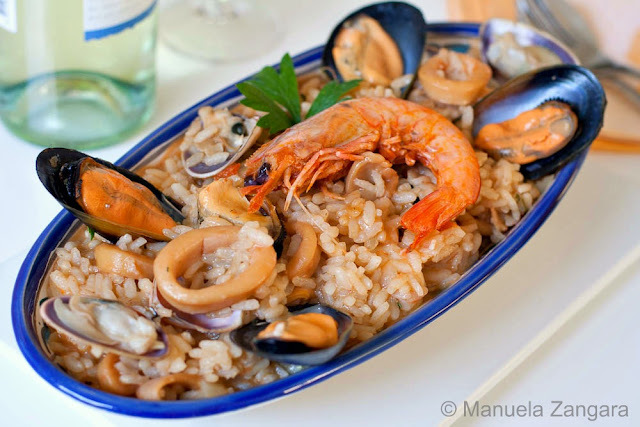 “Alla Marinara” literally means “seaman style” and it is basically the same as “Alla pescatora” (“fisherman style”) and“Ai frutti di mare” (“with seafood”), so it is a seafood risotto and it is most commonly found in the coastal areas of Italy where fresh seafood is abundant. You could cook it with any combination of seafood (the ingredients vary slightly depending on “today’s fresh catch”), but I was lucky enough to find the most classic combo of ingredients at the fishmonger: prawns, calamari, mussels and vongole (or pippies/clams). 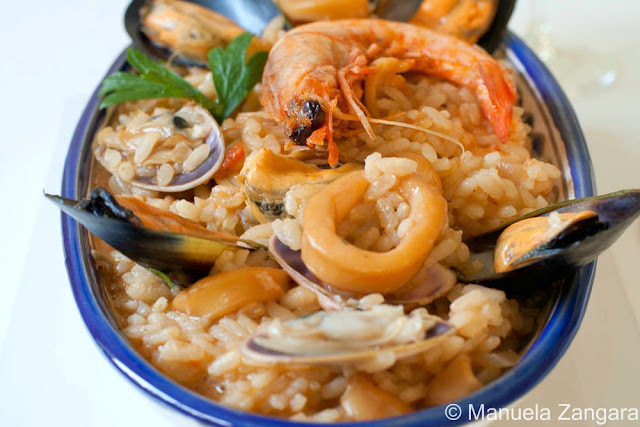 Making this risotto with fresh seafood makes a huge difference, so I highly recommend it. I hope you enjoy it as much as my family and I did! 1. Clean the mussels under running water and keep them aside. Rinse the vongole/pippies and put them in a container filled with salty water. Keep them in the water for a few hours (even overnight). This will help any sand that is still inside the shells to come out. 2. Put all the mussels and vongole in a large pan. Add the garlic, extra virgin olive oil and wine and put the pan on the fire. Cover it and let it cook for a few minutes. You need to check every couple of minutes or so and remove all the shells that open as they are ready. If you overcook them, they will become chewy and hard. Keep cooking until all the shells open (discard the shells that do not open). This will take between 10 to 15 minutes. Remove the majority of the seafood from the shells, but keep a few in the shells to use as decoration. Filter the cooking juice and keep it aside. You will need this for the risotto. 1. 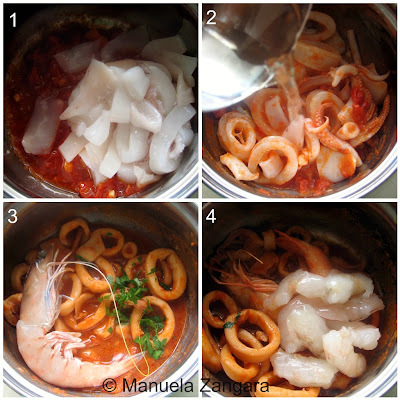 Clean the calamari and cut them into rings (to do this, you can use your kitchen scissors). Clean the prawns (all but one that you will use to decorate the final dish – I cut mine in half as they were really big) and keep ALL the scraps (heads and shells) as you will use these to make a prawn broth for the risotto. 2. Put the minced garlic and extra virgin olive oil into a pot and sauté for a minute. The garlic does not have to burn or it will turn bitter. Add the diced tomatoes and cook on a slow fire for a couple of minutes. 3. Now add the calamari, stir and add the white wine. Cook off the alcohol, then add a couple of tablespoons of water and a pinch of salt and cook covered and on a low fire, until the calamari are tender. The time will depend on the calamari you are cooking. Mine took about 30 to 40 minutes. You may or may not need to add a little extra water to them. When the calamari are ready, add the full prawn and 2 teaspoons of chopped parsley and keep cooking for 5 minutes. Then add the cleaned prawns, stir and cook them for 1 minute. Do not overcook as they will keep cooking in the risotto and you do not want to make them chewy. Cover the pot and put the fire off. Keep it aside. Put the prawn scraps into a pot, cover it with water and add some salt. Put this pot on the fire, bring it to a boil and then let it simmer until it reduces of 1/3. When ready, filter it and keep it aside. 1. 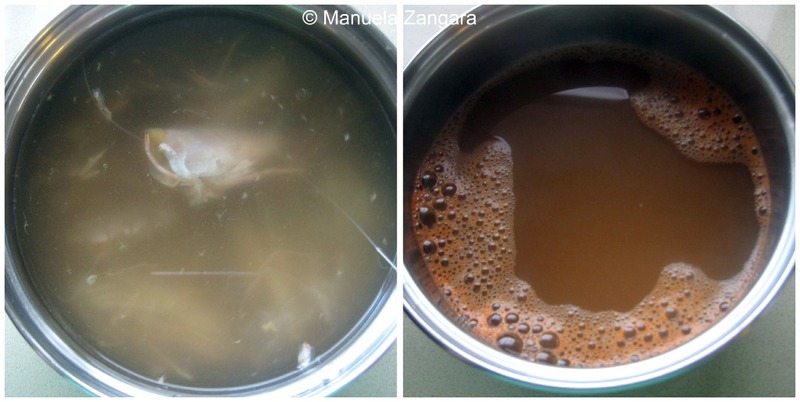 Start by mixing the filtered juice from the mussels and vongole with the filtered prawn broth. Add some water if the final mixture is not 1 litre. Put the broth on the fire and let it simmer. The broth has to be hot all the time while you are cooking risotto, so that the rice temperature does not drop when you add the broth to it. 2. Put the finely chopped onion, garlic and the 2 tablespoons of extra virgin olive oil in a pot and let it cook on a slow fire, until the onion and garlic become soft and transparent. Add the rice, mix well and let it cook for 1 or 2 minutes, until it becomes translucent. Now pour in the white wine and let the alcohol burn off by cooking on a high flame. Then add enough hot broth to cover the rice and turn the fire to medium-low. Keep cooking, occasionally stirring the rice and adding hot broth little by little, until the rice is cooked. It is going to take approximately 18 to 20 minutes depending on the rice you are using. 3. After the first 12 minutes, add all the seafood (apart from the shells and the full prawn that you kept aside for decoration), mix and keep cooking until the rice is ready. A couple of minutes before the rice is ready, add the chopped parsley, check for salt and season to your liking. Stir, put the fire off and cover it for 1 minute. Make sure that your risotto is moist (or, as we say, all’onda – which literally means wavy) and not sticky. You can do that by adding 1 or 2 extra tbsp of hot broth if needed. 4. Decorate the final dish with some more chopped parsley, the full prawn and the mussels and vongole/pippies in their shells. Serve hot! TIP: Whenever you cook risotto, do not wash the rice before cooking. The starch is needed for the risotto to become creamy. That's it, my dear friends! I hope you like our Italian recipe for today! 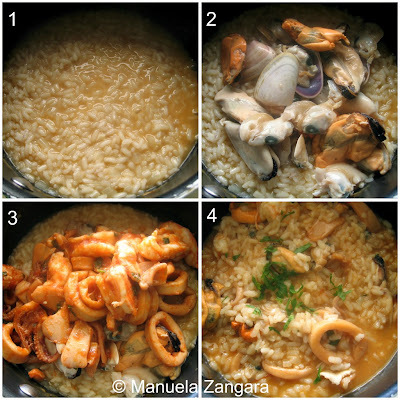 My sincerest thanks to Manu for this well detailed Risotto alla Marina recipe! Isn't she amazing??? If you are into Italian dishes, her blog, Manu's Menu is the place to be! Go check it out! Great guest post Manuela! This risotto looks amazing, as I'm a pure sucker for all things seafood! The pleasure is mine, Manu! Thanks so much for the delicious Risotto alla Marinara! This does look like a fabulous dish. Since I am so far inland, great seafood is hard to come by, you are lucky to be in an area where seafood is plentiful. I can see why Tina considers this dish as one of her favorites. Great guest post Manu and thanks for having her on your blog Tina! Great recipe shared by Manu and one complete meal for the day. During my visit to Italy I did try a few types of similar dish and they make a good change to the our food we tend to have so often at home. Love all the pics attached. Oh wow. I just love everything in this creamy seafoody risotto! Great post! my mouth is watering! YUMMM! Wonderful guest post this looks amazing! Anything with seafood is my favorite! I always love when two of my favorite bloggers come together! Tina, congrats on the wonderful kickoff to your new series! Manu, everything you share is fabulous...and your risotto looks amazing!!! Happy Easter to you both! What a great risotto! I love seafood too and think this risotto looks amazing!!! Manu, your meals ALWAYS look delicious...and make me want to visit your home for lunch AND dinner. Might as well I move in with you! I can be your helpful 3rd child! ;-) Thanks Tina! I'm excited to see all kinds of dishes here and this is a great way to see different food around the world! Manu is a wonderful blogger and dishes out amazing food. Having her over is a great way to kick start your series of guest posts. The dish looks delicious one pot meal. That looks absolutely delish! Love seafood. Love risotto! What a stunning seafood risotto - absolutely perfect my friend as usual! What a lovely dish- I keep meaning to make risotto. I just need to do it. This will be one I try since I love the seafood flavors. Great tutorial, Manu and great pick for a guest blogger, Tina. Wow, this is delicious...i would like to try your recipe one of this day.